Whoever Sends The Most Proposals Out Wins, Right? Finalizing a keynote for tomorrow’s Accelerate conference, I’m at that point where I typically wonder, is the text on my charts large enough to be visible from the back of the ballroom? Will the audience poll work, or do folks not adequately measure their own sales performance KPI’s? Will my bad dad jokes ultimately hurt my business brand? How many Sheldon Cooper references can the participants tolerate? These are common thoughts in preparing for such events, but this conference adds a unique twist: how much effort should I be putting into the cool event-specific mobile app, specifically its slick social media leaderboard? Assuming there’s some pot of gold at the end of the tunnel – a prize for those with the most points as of Friday morning? – am I obligated as a thought leader to join the discussion? Lead it? Stay above the fray of selfies and hangover cure-alls? Considering my speaking time slot – 5:30 p.m. – I figured a little PR couldn’t hurt in promoting the value of my 30 minutes, so on Sunday I started a data drip-feed on the mobile app, just after it went live. Apparently a lot of you work on the weekends, too, because a number of likes popped onto my phone. I contributed a bit more, added my head shot to my profile, and was surprised to see I’d vaulted up the leaderboard to the top few ranks. Awesome! I thought. Not only will I again put my still-snow-covered home behind me for a couple of days; I’m going to own this event! Magic Johnson will be following me on Twitter by the weekend, for sure. Not so fast, Peter. There are many ways to motivate behavior, and game mechanics are a proven methodology in the sales space, when executed properly. Tapping into our competitive nature, providing non-cash rewards, leveraging social collaboration to drive measurable business results: these are all solidly supported by Aberdeen’s research findings. But the event mobile app rewards quantity over quality – which is perfect for the organizers’ purposes – so as I rapidly descended down the leaderboard, I gave up on the idea of a hilarious Magic selfie – I’m exactly the height of Dustin Pedroia – and continued with a thoughtful, slow drip of content, and took solace in the unrewarded but highly rewarding likes and comments that followed. Figure 1: Sales Workflow Productivity: How Do You Compare? So, am I contradicting myself? All high and mighty about re-tweets being more relevant than tweets, but then I’m telling folks to throw more spaghetti against the wall? Yes, and no. Sales is a zero-sum game, you’ve got to have lots of iron in the fire, drive for the “no,” fill your pipeline…and all those metaphors I’ll try to avoid in my speech, are rooted in an unavoidable truth: working harder than the other guys will often yield better results. But working smarter is part of the deal. 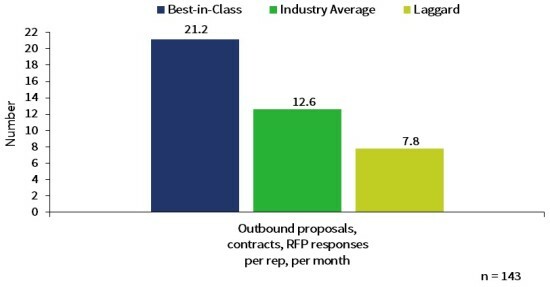 Best-in-Class companies don’t just send out more RFP responses; they send cleaner ones. They report an average year-over-year reduction in proposal errors of 8.5%, compared with only a 1.4% average improvement among under-performers. Eighty-six percent (86%) of their outgoing contracts require little or no post-sale amendments, while Laggards report only a 52% rate, meaning they take longer to start recognizing revenue, and thus add margin-killing barriers to their sales cycle. Here’s a doozy: the Best-in-Class take 48% less time than all others to internally prepare and approve a formal quote. No VP’s of Sales Prevention in those companies. Figure 2: Do Your Reps Spend Time Selling, Or Chasing Documentation? The aggregate of performance deltas in Figure 2 is 15.2%: that’s the degree to which the most successful sales leaders are deploying CPQ, CLM, eSignature, and other late-stage enablers to help seal deals – and aggressively integrating them into their CRM – and luxuriating in the Best-in-Class metrics we’ll reveal at Accelerate. So when I ask the audience to tell me what percentage of your sellers hit their 2014 number, be prepared for some discomfort. I’m not there to put you in your happy place; I’ll let the Everest adventurer speaking after me handle that. My job is to expose the weaknesses in your sales cadence, reveal the KPI’s you need to manage more effectively, and showcase how your competitors are actually crowd-sourcing the answers you need to bring home after the conference. Read the full report here, and good luck with the leaderboard. This article was syndicated from Business 2 Community: Whoever Sends The Most Proposals Out Wins, Right?